My third read for the Once Upon a Time Challenge is a fairy tale of sorts. 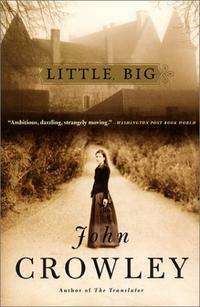 Neil Gaiman called Little, Big one of his favourite books in the world and I do know why. The book is massive, not in size but in scope and delightfully intricate, the kind of book that slowly makes its way into your thoughts, till it's all you can think of. It took me a little more than a month to reach the last few chapters of the book, and then, just a couple of hours to devour it completely! It's not a book full of action nor drama. It is quiet, almost lazy, but quite strong. The book starts as Smoky Barnable journeys by foot to Edgewood to marry Daily Alice Drinkwater, whom he was prophesied to marry long before he knew her. What follows is a story spanning a hundred years, of the lives of four generations of Drinkwaters and their relations in a strange country house situated on the border of Fairyland. Daily Alice, her sister Sophie, her parents and aunts and children are all part of a Tale that is still unfolding and yet, is already written in the cards. Most of the family seem to sense the existence of the other land, and many, like Smoky, though unconvinced, go along with it. The odd creatures from the other world rarely make an appearance in the book, but they're always there, watching, manipulating. As the story unfolds, the inevitability of the fate which was written by a mere stack of cards only strengthens. The book is massive, I said, but it's also small. Little, big, like the title. It's a small glimpse of something that keeps on spiralling into new things, it's a young story from an ancient world. It's Smoky and Alice's boy Auberon writing scripts for a soap opera and at the same time, it's His Majesty Frederick Barbarossa, Holy Roman Emperor, being resurrected after an eternity to rule a minuscule land. The book made me think a lot about people. About me, of course, and about loving someone or losing someone and how both the things are in a pathetic way, quite the same. "Love is a myth", the book tells us, like summer is a myth during a long winter; but it does come and just as surely summer goes away, becoming once again, just a rumour. The book gave me a different perspective on life and a whole new way of looking at destiny: the idea of living without letting the ultimate, total loss of control make you feel helpless. It made me wonder how we automatically assign wickedness to all things unknown, and how wickedness is just a crazy sense of humour. It made me realize how little we are. And so, it made me think about the supposed little things, things like the faces in the cracks of your ceiling and the imaginary friends all our parents have caught us talking to, the stories in our head about life, family, goals and jobs and the big secrets that we let rule our thoughts. Little things that make no big difference do make small differences, I guess. The real big things, big enough to be important in this old, wide world are far beyond our reach. And so the little things do matter, because while they may not change the wide world, they're the things that we control and that change us. We're all a part of something small and something unimaginably huge and balancing it out, often in vain, is what life's all about. Right? For the first few hundred pages, it felt like I was reading a dream until it occurred to me that I was, in fact, reading a life: the prose, with all its meandering nuances was life, rambling on as it does. The story felt so real, precisely because it was so boundless. "In the good old days, when polls were as common as house-to-house searches were now, pollsters asked viewers why they liked the bizarre torments of the soap operas, what kept them watching. The commonest answer was that they liked soap operas because soap operas were like life. Like life. Auberon thought "A World Elsewhere," under his hands, was coming to be like a lot of things: like truth, like dreams; like childhood, his own anyway; like a deck of cards or an old album of pictures. He didn't think it was like life--not anyway like his own. On "A World Elsewhere," when a character’s greatest hopes were dashed, or his task all accomplished, or his children or friends saved by his sacrifice, he was free to die or at least to pass away; or he changed utterly, and reappeared with a new task, new troubles, new children. Except for those whose embodying actors were on vacation or ill, none simply came to a stop, all their important actions over, haunting the edges of the plot with their final scripts (so to speak) still in their hands. _That_ was like life, though: like Auberon's. Not like a plot, but like a fable, a story with a point, which had already been made." Oddly, the book bore an uncanny resemblance to another favourite: Jonathan Strange & Mr. Norrell by Susanna Clarke. They are both so richly... magical. It's odd, because when it comes to the content, they're very different. The magic itself is vastly different. But both books carry that air of something initially mysterious and incomprehensible and at the end, honest and strikingly witty. Reading both the stories was like trudging through a long winding road, expecting a concrete destination, maybe a final showdown and realizing at the end just what the road was all about. It was when the pieces fell together, so to say, that I realized that they always were together; the picture was always complete, I just hadn't deciphered it. The experience, though fascinating and intriguing, left me feeling almost silly both times, like when you first notice the faces in Rubin's vase and wonder how you could have missed them. Perhaps the next time I read such a story, I won't be fooled. And so, it would, I imagine, be an altogether different journey to re-read either of these books. I am curious to know whether I'd discover, learn everything then, that I've overlooked now. I never knew this was Gaiman's favorite book ever! I read half of it, and then abandoned it for some pressing need which I can't remember now, but I do remember being quite enthralled with what I was reading both in quality and content. I need to pick it up again and finish it this time! One of his favourite books in the world, actually, but that's still high praise, don't you think? That ought to convince you to pick it up again! I love your review! You just gave me one more reason to read this book. I've wanted to read it ever since author L.R. Fredericks (she wrote Farundell and Fate, both of which I liked a lot) said it was her favorite. I didn't know it was Gaiman's favorite as well. Delia - Thanks. I keep scouting for book on Gaiman's blog, which is how I found this, turns out I end up loving the books he recommends. :) You should read this one soon! And I'll look for the books by L.R. Fredericks.